I will cross-post some pictures here, and update as I progress, with links to those construction notes and tutorials. I am making a hifu set for my son. I already addressed concerns about hifu vests for boys elsewhere - I've learned that not many people are aware that there are hifu vests for little boys, in past years it is more commonly seen on girls. Because of this, I think it is important that I say a little bit about this before going on. I've been "window shopping" for this first Shichi-go-san since I learned I was having a boy, so I've been aware of growing and changing trends over the past few years, but I had neglected to realize others may not know those modern trends. I've had some concerned people contact me thinking that I was crossdressing my son, some more... harmfull... than necessary. Nope, hifu vests are made for boys as well, and is rapidly gaining popularity due to comfort and ease. 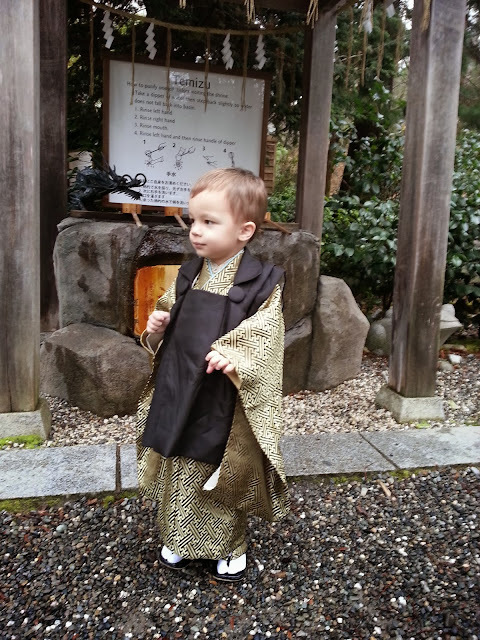 Traditionally, suits were more common for 3 year old boys, but as interest in Japanese clothing increased, hakama for 3 year olds became available (despite tradition of a boy receiving his first hakama at 5 years old). Boy's hifu have been a style since at least 2007, possibly longer, so a relatively new fashion, but one I agree with due to its practicality and comfort for small children. Hifu vests for boys came about as a traditional style to replace heavier hakama styles that previously were popular, but were exhausting for small delicate children. Open-front hifu vests for both genders have been around for decades, the closed front hifu vest is relatively new for boys, but not so different from what has been around for a very long time. This new style has grown so much in popularity, that the market (manufacturers, salons, studios, independent artisans) offer a huge variety of options of hifu, comparable to other available styles such as hakama or suits. 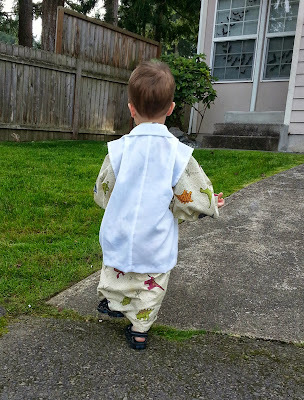 I know that my son would not be comfortable or tolerant of more difficult styles such as hakama, so this is the style that our family has decided is best for him. While I don't consider myself one who attempts to stay on top of trending fashion, I also do not think that we should be so strict to adhere to outdated styles or fashion rules which may be impractical. I could go on, but I discussed it more here: http://kimono-life.blogspot.com/2013/09 ... sings.html and made a Pinterest gallery of popular boy's hifu styles for those interested in seeing examples: http://www.pinterest.com/amandasarnoski ... -boy-hifu/ I realize that the style is new to many people, but I hope I've provided enough to show that I'm in fact not "harming" my child's sexual identity or challenging so-called gender-specific clothing shapes. :( I could go on about the subject, but for now I just hope to no longer be guilted in an attempt to conform to another's ideal of gender-specific clothing acceptability. It takes time to acclimate to changing styles, so I realize that there will be people who do not like the style or think it strange because of previous conceptions. As much as I appreciate others' opinions, I don't feel it is appropriate to judge others on their special day, especially life events that do take much consideration such as this. Don't worry, I've put in several years of thought on this, especially consideration for my son's comfort and what is best for him. After 15 years experience studying kimono and observing changing trends, I am pretty well equipped to know what would be a cultural/fashion faux pas, haha! Anyways, I got the yucky part out of the way, whew! Now onto the pics! 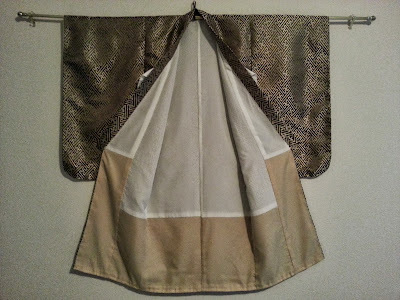 :katana: I am making everything for the ensemble, kimono, hifu, juban, tabi, and zouri. This is partly for sentimental reasons, budget concerns, and to challenge myself. I've been sewing for a while now, this is a good opportunity for me to improve my skills. 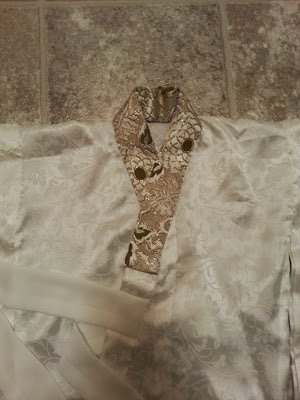 I used a light brocade (shiny!) for the outside, light ivory polyester for the doura lining, and light mustard crepe for the hakkake. Turned inside out. It is completely lined. I'd always wanted to try making zouri, little baby boy zouri is a good place to start practicing. It was difficult, and the results certainly aren't as good as store bought, but for a first try it is great! 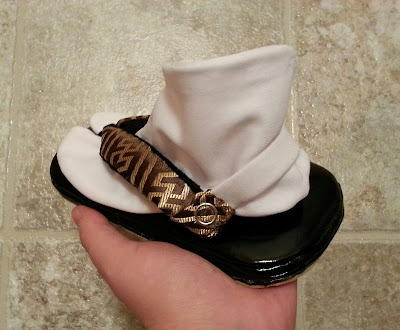 If I were to do it again, I probably wouldn't put as much padding in the sole since it does wrinkle a bit, but for my son I want him to be comfortable. And these are oh so soft and comfy! 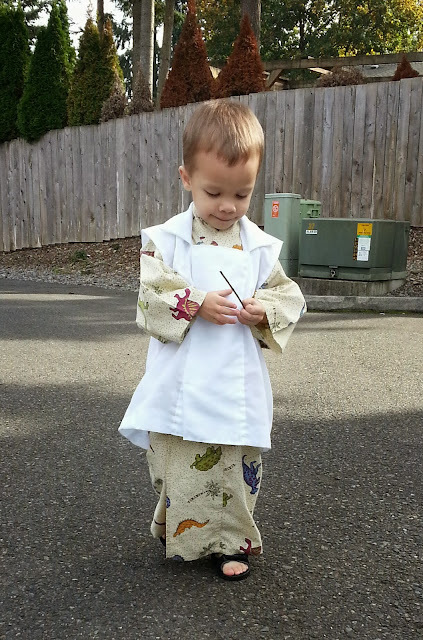 He modeled it with his dinosaur yukata, aside from the sleeves it is the same size as his kimono. My measurements were correct, yay! And most importantly, he loved wearing it. 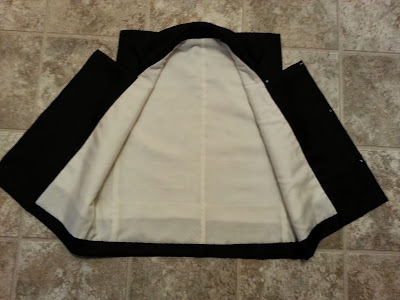 I've updated with instructions on how I made my son's hifu vest. 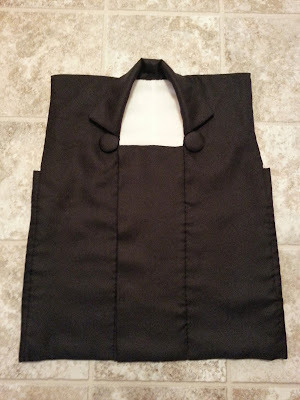 This is the hifu vest prior to sewing the shoulder tucks. 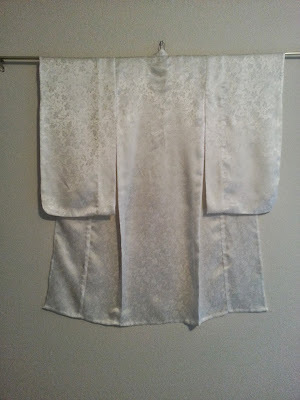 I made the tabi out of white stretchy soft fabric. 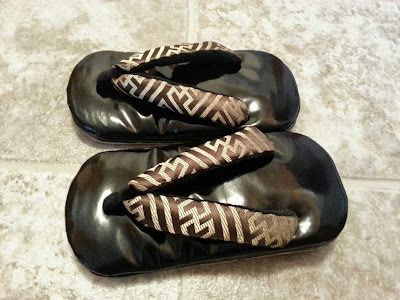 They are lined, and the soles are interfaced to prevent the soles from stretching. That also made them super-plush and comfy! 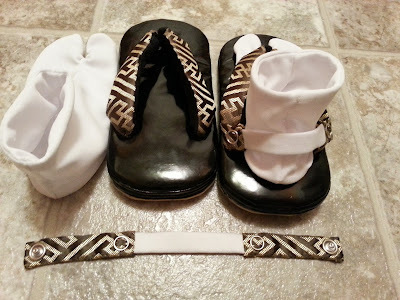 The suberi-tome are straps for children to help keep zouri and geta on their feet. Store bought ones are usually red, pink, or ivory, and the elastic is sheered (bunched up). I wanted the straps to blend in so that they would not be noticeable, so I used the same fabric as the zouri's hanao for the snaps, and the same stretchy fabric I used for the tabi to cover the elastic. I was very ill before, during, and after Shichi-go-san, so I ended up taking a very stained child's grape leaf pattern nagajuban I had in my fabric stash, unpicked it, bleached, and sewed it back together into the appropriate size. 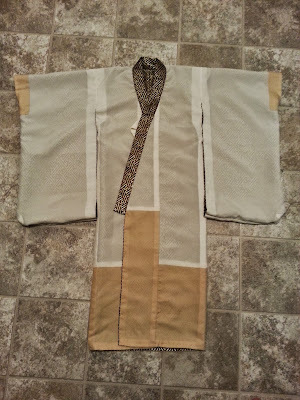 It took far less time to do than cutting pieces out of western fabrics. 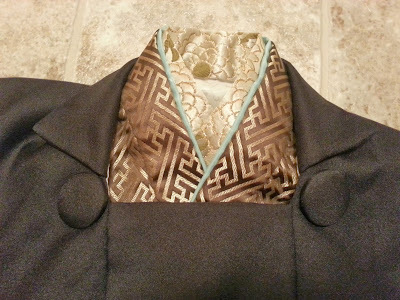 While the motif isn't typical, it looks neutral and non-flowery enough that I was okay with using it in a pinch. The fabric did really well with being washed in the washing machine, and then bleached in a weak solution. 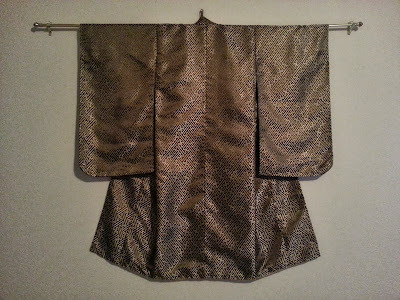 The han'eri is gold and olive green brocade with a kiku pattern. The ensemble, while shiny, is plain design, so I wanted a flashy collar. There is the complete set! 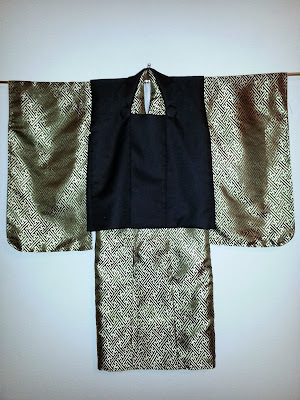 Thank you everyone for your encouragement as I made this kimono set! It truly made his Shichi-go-san special. utsusemi , all of the fabrics are Western width fabric. 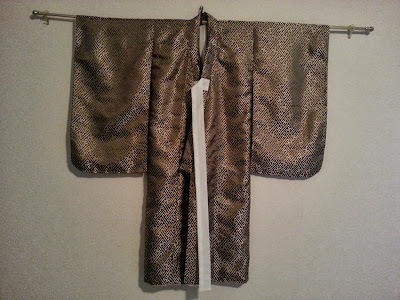 The kimono is sayagata patterned, I call it brocade for lack of a better word, it is woven with thick threads of silky rayon. I believe the fabric was made in China, bit it was years ago that I bought it. Gikuyu , Yes, he always gets excited when I make things. When I finished the test hifu he was excited to try it on, he doesn't realize it isn't the final garment. He likes to "assist" on my projects by handing me things, watching closely, and clinging to my back while I use the sewing machine. He will pick up cut pieces of fabric and drape them on himself to try and see how it looks. When I sew by hand, we both sit on the couch and he embroider on scrap fabric, he has his own embroidery hoop and blunt needle. So he always feels involved on projects. :lovelove it is pretty darn cute! It is beautiful! 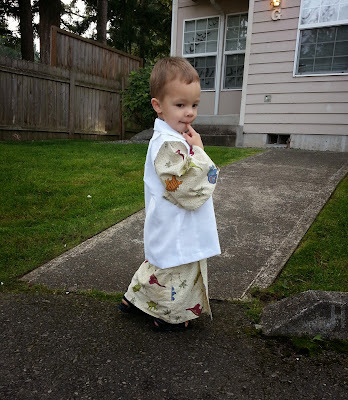 Do you have a tutorial for the boy's kimono? What a cutie-pie! And you did so much impressive work! Thank you for posting. I did not see this until just now. That is just too adoreble!